Hello Gorgeous: Christmas Balls Galore. 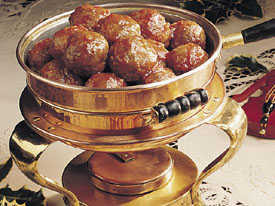 I am all about the balls at Christmas. I never realized to what degree. 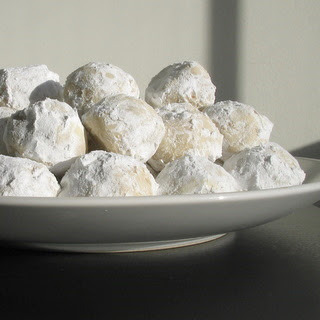 Yesterday I made Snowball Cookies (most well-known as Russian Tea Cakes) and Cocktail Meatballs to freeze and heat in sauce for Christmas day. The sauce sounds unusual combining chili sauce and grape jelly but I promise you it's good. I don't really eat red meat but it's a much-requested favorite. Today I am going to make old-fashioned cocoa fudge (in squares!). It's not too creamy and has a richness new fudge lacks. It's what my mom made when I was a kid so I'm partial to it. It's on the Hershey's website here. Then I am making many other non-ball-shaped things including spinach and blue cheese phyllo pastries and Scotcharoos (Rice Krispie treats with peanut butter and butterscotch and a layer of chocolate - the kids love this). I am going to be absolutely rotund by the new year. Well Balls it is! Why not shape the fudge and the scotcheroos into balls too? Why mess with a good thing?! Everything looks and sounds just delish! hAVE A WONDERFULLY HAPPY AND mERRY cHRISTMAS! Enjoy the baking. It all sounds wonderful. YUM - nothing like a good Christmas appetizer! OMG. I used to go to these bbqs a couple summers ago, and the one of the girls would make those meatballs with that jelly recipe and she would NEVER give it to me! Hi Megan! Everybody go look at Megan's cute shop. Please Sir - We usually do sit-down dinner and this year it's appetizers and sweets. Yay. Greta - I added the recipe link to the post. Just click on "Cocktail Meatballs." The only difference is that I only use about 1 teaspoon of salt and I fry/brown them in (about 1/4 c.) shortening because I didn't know about this healthier version (and it's only once a year, right?). Then you clean out the frying pan, add the jelly and chili sauce, melt it and add the meatballs and let them simmer for a little while. Then I transfer them to a crockpot because they get practically carmelized with the sauce in about an hour or so. Two balls post in a row. Hee hee! I'm thrilled to see everyone going balls-out with their holiday prep! Meeting you all and becoming a little part of this community truly has been a gift. Here's wishing everyone the brightest of holidays and all good things in the new year. Mmm...that fudge recipe looks divine! And of course all I can think about is the hilarious Alec Baldwin/SNL sketch with the cooking show and the balls at christmas time...have a great ball filled holiday! What goes a-round lands on my thighs. Damn, we are what we eat, aren't we? I may well be an apple-stuffed struedel, then. Emphasis on the "stuffed." Thank you, thank you, thank you, Gorgeous!! !